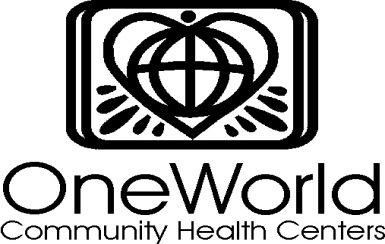 OneWorld Community Health Centers (Omaha NE). OneWorld’s project, led by the Human Resources Department in partnership with the Operations Department, creates a learning academy for entry level workers, primarily immigrant workers of Hispanic heritage. The project is aimed at retention of new and current employees through a new opportunity for professional development encompassing a learning academy supported by elearning alongside educational and mentoring opportunities which establish a framework for an Operations career ladder. OneWorld will produce a curriculum of leadership for front line workers in the Center’s Operations Department. A career ladder for current operations staff to become mentors for new entry level employees will provide an opportunity for salary and skill advancement. Establish a Learning Academy with elearning opportunities for entry level operations employees to meet current and future workforce needs in the operations department at OneWorld. Implement a career ladder model in the Operations Department by training operations staff as mentors who will receive additional professional development opportunities and increased salary for expanded capacity. Conduct a comprehensive evaluation and create a written report on lessons learned and key elements of success to be used as a “roadmap” to creating a leadership academy for entry level workers from the Hispanic community and sustain professional development in the Operations department. Job-specific assessments and skills testing were developed for six operations positions, including front desk support, patient support, medical records, phone, financial and marketplace. Customer service and Health Insurance Marketplace modules were also added to support staff training for the transition to a federally-facilitated health exchange. Further, One World was able to establish a career ladder model in the Operations Department, which was successfully implemented through the creation of a five- session “Mentor Academy.” The mentor academy curriculum included mentor competencies and expectations, tailoring mentoring to the needs of the learner, enhancing staff learning, coaching and providing effective and ongoing feedback. A comprehensive project evaluation to evaluate lessons learned and key elements of success was developed under contract with the University of Nebraska at Omaha. Over the grant period, 19 new hires in four cohorts completed the training. Relationships between supervisors, new hires and their mentors have increased OneWorld’s employee satisfaction scores. Established a Mentor Academy. Eight mentors were chosen for an initial Mentor Academy from among fifty-two Operations Department employees and total of eleven mentors were trained over the year in two academy sessions held June 26, 2013 and October 29, 2013.